I am excited to announce that Gluten Free by the Sea is collaborating with Helen Jones of Simply Moorish, who will be holding a Christmas ‘Free From’ Food Fair at Ivybridge Community Market on Saturday 7th December. Fellow collaborators Love Lactose Free Life and Plymouth Greengrocer will be selling their ranges of gluten and dairy free products as well as Helen on the day. Helen is now working hard to attract more ‘free from’ exhibitors to the event and the communication below has gone out to potential traders today. I hope to see lots of friends of Gluten Free by the Sea at the event, both buying and selling! Please pass this on to anyone who you think would be interested in having a pitch at the event. More details to come as they are finalised. 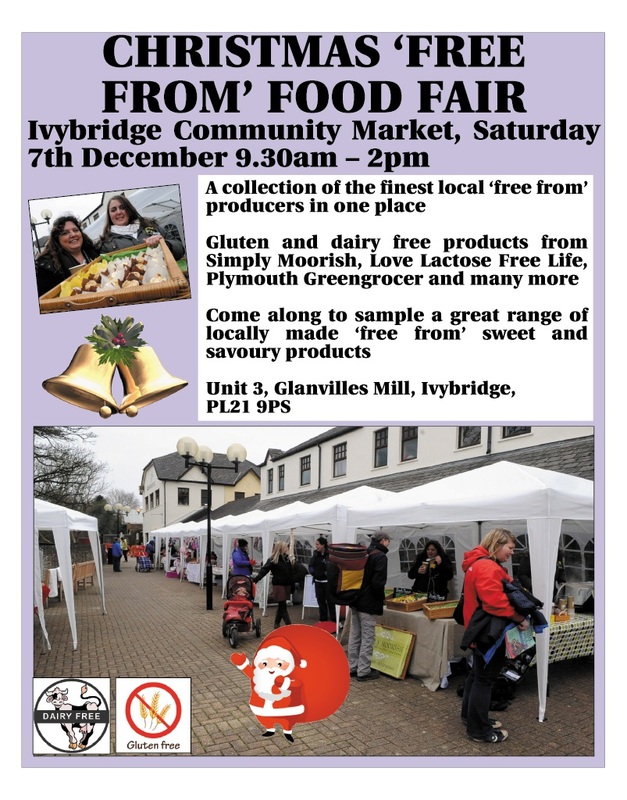 Ivybridge Community Market are pleased to announce that we shall be holding a Free From Food Fair on Saturday 7th December 9.30 – 2pm and take this opportunity of inviting you to attend to trade at this great event. With keen support and collaboration with Gluten Free by The Sea, Love Lactose Free Life & Plymouth Greengrocers. With the build up to Christmas, this will be a great opportunity for the sale of your usual products, themed products and free from gifts. This is a great opportunity for all ‘Free From’ food producers to showcase their products in Ivybridge and its surrounding community and we welcome you to invite additional traders that are not on list whom you may feel appropriate to trade at this event. Please find attached a copy of the poster being used to advertise this event and wherever possible kindly use such to advertise the event in your local area, online or via social media. We have a visible presence on Twitter @ivycommarket and Facebook please feel free to link this into any social networking you may use to promote the event. Please also find attached a copy of the terms and conditions for trading with a booking form for you to complete. Kindly return this via email to simplymoorish@yahoo.co.uk or via post to FAO. Ivybridge Community Market Management Team, Home from Home Community Hub, Unit 3 Glanvilles Mill, Ivybridge, PL21 9TH. The price per pitch is £15.00 with an additional £5 per pitch should you require power. There are electrical points however, you will need to supply your own extensions and rubber matting if needed. The main area for use for the market is outdoors and we hold ten 3 x 3 gazebos which will be allocated on a first come first serve basis. Additional cover can be provided under the walkway. If you do have your own gazebo cover please feel free to utilise this. We would greatly appreciate your prompt response in booking your trade spots. The cut off date for bookings is Saturday 30th November 2013. If you have any questions, which are not covered within the attached documentation, please do not hesitate to make contact with me email. I look forward to receiving your booking forms and hope that you will embrace and reap the rewards of bringing your products into the local community. As readers of Gluten Free by the Sea will know I am extremely keen to spread the word about (good) small local gluten free producers. 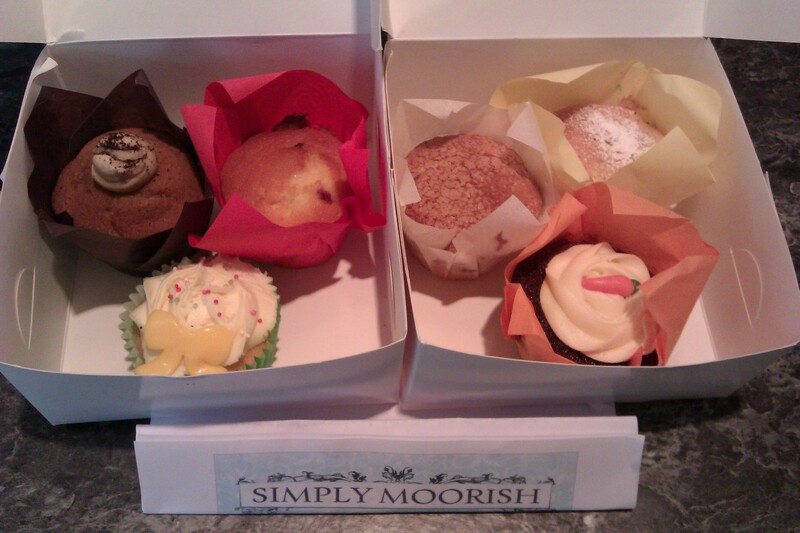 I was recently lucky enough to be given some gluten free muffin and cupcake samples from Simply Moorish, and I’m pleased to be able to add another such company to the list. Simply Moorish is run by Helen Jones and is based in Ivybridge on the outskirts of Dartmoor, hence the clever company name. I ensure that I do not work within the same area of the kitchen as I do when using gluten products. If I do have to make use of additional cooking space I ensure that this space has been thoroughly cleaned down before so. I use an independent selection of kitchen utensils when baking with gluten free products. I store my gluten free base products, adequately labelled, in a store cupboard all of their own so as to avoid cross contamination. When I purchase my flours and additional ingredients I aim to bag them separately when shopping. I only use Doves gluten and wheat free flour for baking and I am confident that this product has consciously been produced. Transporting products. When selling via wholesale I make sure that my products are packaged in sealed cake pods to avoid contamination from other items within the same chillers. When selling items open, I use the same lined wicker based trays to display my products. As for the products themselves I really enjoyed them. My sample box included a lemon and poppyseed muffin, blueberry muffin, cranberry muffin, coffee date and walnut cake, a vanilla cupcake and carrot cake. Everything had great texture and flavour and was very well presented. My personal favourites were the muffins. I’d not come across any locally made gluten free muffins before, and the shop bought ones can often taste over processed. I’ve been back and bought the muffins as well as some delicious and fantastically decorated chocolate cupcakes a few times now. I can highly recommend these cakes and it’s good to see another local producer coming up with great gluten free products. You can buy Simply Moorish products at Ivybridge Community Market, which runs at the community hub in Glanville’s Mill. The market itself was co-founded by Helen with Jo Jopling, and runs the first three Saturday’s of every month. 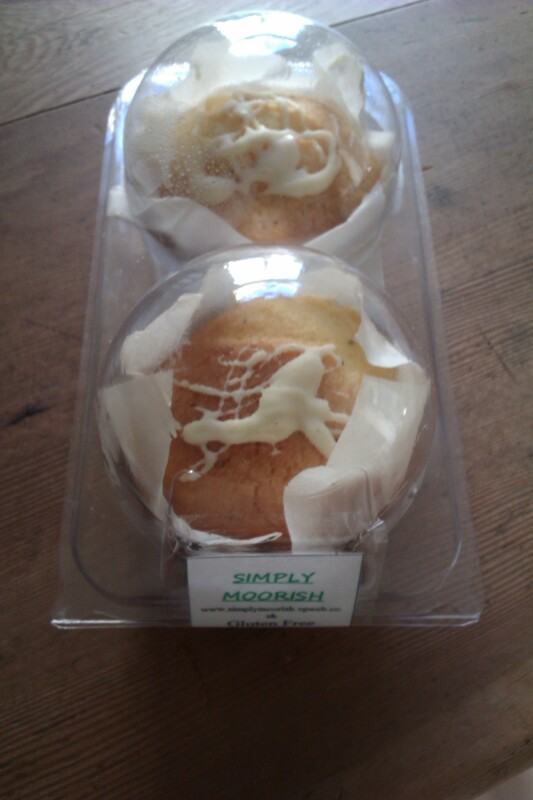 Gluten free muffins and cupcakes have also recently become available from our friends at Plymouth Greengrocer. Helen is also on the lookout for more wholesalers for her Simply Moorish products. For more information on Simply Moorish see their website, Facebook or Twitter.